I am an experienced professional and certified yoga instructor. Born in the land where Ayurveda, the ancient system of life originated, it’s easy to see why I chose and grew up to become a yoga instructor and personal trainer. Needless to say, I have a strong background in Yoga, Pilates, Ayurveda and Panchakarma Therapies, including Reiki. 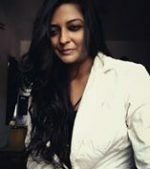 I have been working as a Yoga instructor for years and have earned multiple certifications such as the Certification in Personal Fitness Trainer from the International Sports Sciences Association (ISSA), Certificate in Yogic Science from the Baba Ambedkar Open University, and Certification in Ayurveda and Panchakarma Therapies from the Indian Institute of Alternative Therapies in India. I am a certified Yoga teacher and am also approved by the Canada Yoga alliance (YACEP & ERYT). Before my journey into the mind, body and soul aspects of yoga started, I received a Masters in Mass Communication and Journalism from Sikkim Manipal University, India. Knowing that the mind plays an essential role in our physical, psychological and spiritual wellbeing, I further explored other techniques such as Hatha,Ashtanga, and Vinayasa, Reiki, Ayurveda and Pilates. My goal is to help myself and others fight all vulnerabilities and limitations, and strengthen and heal all levels of being, which led me to creating my website, Yogaearth.co. For those who are wondering “why Yoga Earth?” It’s because my is Parthi, which in Hindi means, “Daughter of Earth” which is the inspiration for my website. For me, yoga is much more than just a passing “fad”. It’s my passion and I aim to inspire my students to help others raise their vibrations through my Vinayasa classes. Through my yoga classes, students can learn proper alignment and deep meditative stretches for strength and flexibility, along with the ability to carry a state of calm both on and off the yoga mat. Through my years of teaching, I’ve been recognized for creating a comfortable and relaxing ambiance. I have been told that my positive attitude and energy lead to well-rounded classes, where my students actually learn and practice yoga. Yoga has brought about a profound purpose to my life and I’ve embraced this personal journey by thinking of myself as a student still. It’s a pleasure to share my practices and experience with others. Along with yoga, I have a true and undying love for Ayurveda, Pilates and Reiki, and have also integrated the healing properties of Ayurveda into my yoga classes. With a focus on form and posture correction, I offer mat Pilates classes that are the perfect workout for your core and glutes, and can help students achieve a leaner, more toned physique. Ayurveda is synergistically complimentary with yoga. As a sister tradition of yoga, it offers proven wisdom on living a healthy and balanced lifestyle. I believe I can help you tap into the goodness of Ayurveda and apply it into your life. Regardless of your age or goals, or if you are a professional or beginner, as your instructor, I create personalized classes meant for your needs. I will give you the tools and techniques to help you become the best version of yourself. To find the trajectory that is in total alignment with your life path, contact me today. You can find me on my mat and teaching at the Chamelle Club and spa at Jeddah, Saudi Arabia. Reiki healing is an ancient holistic therapy using life force energy to enhance your natural healing. It involves a Reiki practitioner placing hands on or above your body to balance your all seven Chakras and balance mind and body. It promotes healing and general wellbeing for many ailments and mental and emotional strains. This therapy can be used on anyone including pregnant ladies and children, it can help with post-pregnancy healing, post-pregnancy stress and depression. Reiki Distance Healing is very effective, it cleans up all negative energies and energy blocks i.e Aura & Chakras. This provides instant relief from Pain, Anger, Anxiety, Stress, Frustration etc.